A new study looks for the first time at the impact of human noise on an important type of humpback whale foraging activity, bottom-feeding on sand lance. The research took place in the Stellwagen Bank National Marine Sanctuary in the southern Gulf of Maine, where humpback whales routinely do deep dives at night, rolling to their sides when they reach the bottom to forage for the small fish. To assess the whales’ responses to human noise, D-Tags were placed on ten individuals over the course of two years. These temporary suction-cup tags record received sound levels that the animal is hearing, as well as tracking the details of their dives. The tagged whales made 218 dives, 83 with ship noise exposure and 135 without ships nearby. The raw numbers put the effects into some more straightforward perspective. Half of the ten tagging events, each of which included multiple foraging dives, included at least one full dive during which the whale failed to do a side-roll in the presence of ship noise, while the other five sequences showed side-rolls on all dives (one whale was tagged in both years, and following this half-and-half pattern, fed normally one year and omitted side-rolls on some dives the other year). Of the 18 ship passages that occurred while whales were tagged, 13 led to no change in side-roll behavior, while 5 included some dives with no rolls. Not surprisingly, then, ship noise did not cause a dramatic cessation of side-rolls; only 8.4% of ship-influenced dives (7 of 83) failed to include them. Still, this is a big increase over the mere 3% of dives (4 of 135) that omitted the side-roll when ships are not audible. …(T)hese results are among the first support that ship noise can impact humpback whales’ foraging, making this source of disturbance a management concern. Chronic impacts of even small reductions in foraging efficiency could affect individual fitness and translate to population-level effects on humpback whales exposed to ship noise in critical foraging areas. 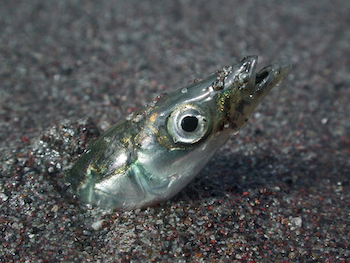 The authors also suggest that there is a chance that the ship noise actually affected the availability of the sand lances, rather than or in addition to simply changing the whales’ foraging behavior; they note that sand lance have been shown to burrow deeper into the sand in response to disturbances, though it’s unknown whether ship noise triggers such a response. This calls to mind another recent paper (abstract only here), which highlights a crucial new point: when studies are able to include information about prey availability and other contributing factors, it becomes much easier to discern the subtle behavioral effects of noise. Indeed, in many situations, behavioral changes may be barely discernable when looked at in aggregate, and are “only evident with the increased explanatory power provided by incorporating prey density and distribution” into the analysis. And so it goes, science ticking along one small step at a time. New studies following up on key questions and uncertainties that were revealed several years earlier (since it takes years to plan, fund, carry out, and write up findings). Each new paper highlighting some small hint of an effect, though rarely (if ever) being absolutely clear and unambiguous. (Even the current study, while finding small but significant changes in behavior, can only speculate about effects on individual or population fitness, as it doesn’t attempt to assess total food intake, reproductive changes, or other measures of vitality.) Study by study, decade by decade, we dig ever deeper into the complex question of just how our nearly ubiquitous human noise is affecting the lives of ocean animals, many of whom were born into seas that sounded very different than the ones they now inhabit.